Saturn's former manufacturing facility in Spring Hill, Tennessee was as revolutionary as the brand's innovative cars and industry-leading retail sales and service experience. This state-of-the-art plant was located approximately 30 miles south of Nashville on Highway 31. Visitors to the plant were presented with several materials, including a safety pamphlet that included the map of the complex that you see above. Die Cast Operations - Parts cast in this area include transmission cases, transmission pars, and engine covers. Lost-Foam Casting - Parts produced here include engine blocks, engine heads, crankshafts, and differential cases. Casting technology uses patterns of fused polystyrene beads. Transmission Assembly - Manual and automatic transmissions are built on the same line with the flexibility of building up to 70 percent of either transmission to meet market demand. Engine Machining Line - Flexible machining allows for one production line of both single and dual engine heads. Final Engine Assembly - Team members assemble performance and base engines on the same line. Skillet Application - Traveling wooden platforms, or skillets, allow team members to travel with the vehicles as they assemble them. Adjustable scissors lifts raise vehicles for easy installation of the panels. Cockpit Operation - All cockpit parts are installed and tested for proper electrical function prior to placement of the cockpit into the vehicle. Trim Installation - Using the skillet system, all interior and exterior trim is installed. Towveyor Operation - Completed chassis are installed into the spaceframes. Interior Systems - Trim is fabricated for the interior of the vehicle using injection moulding technology. Inspiration Point - Shipping point for world class vehicles. Body Panels - All exterior panels prone to damage such as fenders, doors, quarter panels, and fascias are made of rustproof, dent and ding resistant, polymer panels. Body Fabrication - Various parts of the spaceframe are welded including motor compartment, rear compartment, and floor pan. The central point in Body Fabrication is the body framing and respot welding line. Paint - A unique paint system applies waterborne paint in layers. A universal primer-sealer is used to treat steel and polymer panels before the base coat is applied. The waterborne pigments then receive a clear finish for protection from chipping and fading. All utility-monitoring is centralized on site in CUC for immediate resolution of all problems. Working partnerships with local utility resources enable Saturn to purchase some utilities (electricity, gas, and water) and produce others (compressed air, deionized water, chilled water, and cooling water) where it is most cost-effective to do so. The result is a significant cost savings over a traditional plant, well over 40 percent. CUC also headquarters Saturn's environmental program. During the site construction phase, early gathering of baseline data, as well as attention to water and soil conservation, has earned Saturn four prestigious environmental awards to date. 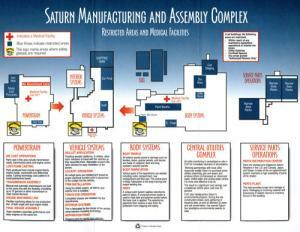 Parts Distribution Center - Parts are stocked and shipped to Saturn retailers in the U.S., Canada, Japan, and Taiwan. A state-of-the-art replenishment system maintains a high availability of parts at the retailer. Parts Plant - This area provides a longer term storage of parts. Packaging of incoming material and processing of retailer returns to inventory occurs in this building. Download a full-size version of the plant diagram. Then, peruse through a collection of even more pictures from the site. There are currently 9 users and 417 guests online.